Buttery, sweet, and fluffy...french toast is the best. Who doesn't have fond memories of someone special making them french toast on a Sunday morning? It may be called FRENCH toast, but it's definitely near and dear to this American girl's heart. This simple french toast recipe relies on a few simple and quality ingredients. French toast can make any weekend feel special. Serve this up for a house full of guests or just for yourself! And it's even better if you serve it with...BACON! If you are using bread on the fresher side, make sure to let the bread soak for less time. The more stale the bread is, the longer it should soak. You can also use french bread, ciabatta, whatever leftover bread you have on hand. But as a rule, the thicker, or drier the bread, the more egg/milk mixture you will need, so if you are planning on using that type of bread, make sure to make more of the mixture! You can also use this recipe to make a french toast bake. Just throw all of the ingredients into a baking dish and bake for about 30 minutes at 350 degrees. Beat together the eggs, whole milk, sugar, vanilla in a flat, and deep dish. A casserole dish works well. Sprinkle the nutmeg and cinnamon over the top of the milk mixture. Whisk the spices in with the mixture until completely combined. Heat a large griddle to medium high heat. Use a fry pan if you do not have a griddle. A cast iron pan also works really well. Dip the bread slices in the milk mixture. Let them sit and soak up the mixture, for longer if the bread is stale. Be careful not to let fresh bread sit too long, or it will become too soggy to take out of the mixture! Flip the bread so that both sides have soaked in the milk mixture. Butter the griddle and turn down the heat to medium. Place the slices of french toast on the griddle. Watch the heat carefully and turn down if necessary as to not burn the french toast! After about 2 minutes, flip the slices of french toast and cook for another minute to two minutes on the other side. Remove from the griddle and keep warm in a 200 degree oven until you are ready to serve all of the toast. 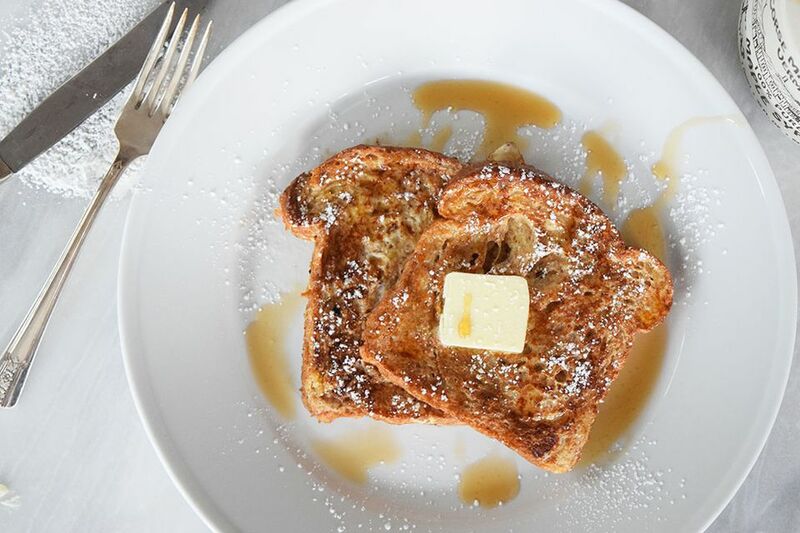 Top the warm french toast with maple syrup, butter, and powdered sugar!